FORT LAUDERDALE/DAVIE, Fla. – It’s over. After all the posturing, pontificating and prognosticating, we have a winner in the first-ever, Nova Southeastern University (NSU) Shark Race to the White House and it’s YUGE! The winner – Trump Shark! After logging mile after mile from September 26 through noon, Fri. Nov. 4 the Trump Shark beat the Clinton Shark 652.44 miles to 510.07 miles. 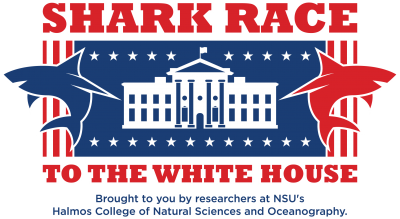 Shivji said that the idea behind NSU’s Shark Race to the White house was to have some fun with the election season as a way to bring attention to the research he and his team are doing related to mako sharks. Shivji stressed that the two sharks in the race, and sharks in general, are non-partisan and our poll wasn’t rigged in any way; these sharks are just doing what sharks do – swimming in the ocean. For the race, a special website was created – nova.edu/presidentialrace – where people from around the world could see, in near real-time, the migratory tracks of the Trump Shark and the Clinton Shark. Fans of sharks can also view the other sharks Shivji and his team have tagged and are tracking online via nova.edu/sharktracking. Shivji leads the research at NSU when it comes to sharks – from makos to tigers to oceanic white tips. 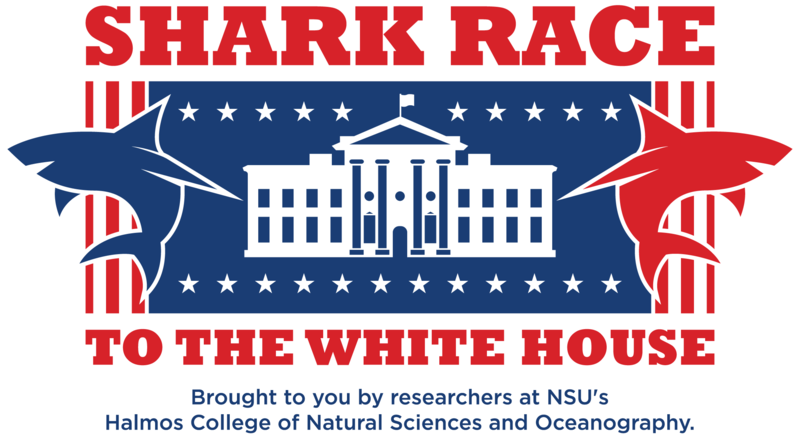 The two sharks selected for the Shark Race to the White House are part of the ongoing marine science research on shark migrations at NSU’s Halmos College of Natural Sciences and Oceanography. These sharks are contributing to the ongoing research by NSU scientists as they learn more about mako sharks in order to better protect them. While this was a fun, light-hearted way of looking at the 2016 Presidential Election, the research behind this project is pretty serious. Shivji indicated that worldwide, sharks are being killed off in unimaginable numbers – some estimates say between 70-100 million sharks per year. Clearly, that is not a sustainable level of removal, since many shark species, including makos, reproduce at low rates. That’s why the work being done at NSU is vital – we must learn as much as we can about these majestic creatures so we can take steps to ensure they don’t vanish from the Earth. Research has been, and will always be, one of the pillars that supports a world-class education at NSU.